By buying this product you can collect up to 28 loyalty points. Your cart will total 28 points that can be converted into a voucher of RM5.60. Rekaan Eronomik – Rekaan yang mesra tubuh untuk keselesaan pemakaian yang optimum. Strap Bahu Berlekuk – Mengelakkan dan geresan pada kawasan ketiak pemakai. Selain, mengikut bentuk semulajadi tubuh. Strap Pinggan berlekuk & boleh di laras – Penggunaan tali terbina dalam pada Tugeda iDEAL, memudahkan untuk digunakan oleh pelbagai saiz bayi dari kecil hingga besar tanpa memerlukan penggunaan aksessori tambahan lain bagi mencapai keselesaan yang maksimum bagi bayi dan si pemakai. Tugeda baby carrier is an Ergonomic Baby Carrier type Soft Structured carrier that produced in Malaysia. We specialize in making Baby Carrier, (Soft Structured carrier) that can helps parents/caregivers to have both hands free to get on with day-to-day life or doing your activities with baby’s around. So you can have more freedom to do what you need to do anytime, anywhere. Soft Structured Carrier also the baby carrier that support natural seating position (known as M-shape) which recommended position for healthy hip development. It’s important to protect your baby and to prevent Injury to baby’s.Tugeda Baby Carrier, soft structured Carrier suitable to carry babies from newborn to toddler year. 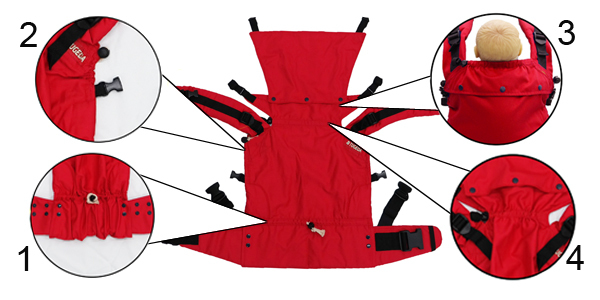 Soft Structured Carrier has been designed to protect baby’s spine to maintain it’s natural curve. It soimportant not to put pressure on baby’s spine at early stage of life to prevent injuries and to make sure it growth heathily. Soft Structured Carrier is a safe baby carrier for you and your baby to use for long hours comfortably and not cause your back ache. You can enjoy every moment together happily and it essential gear for your Smooth ParentingJourney. Tugeda baby carrier | Soft Structured Carrier also easy to use and it’s hassle free. You can wear easily by your self without any help from others. Tugeda baby carrier unique and beautiful designs, keeps you instyle and made you so special. You will be like a superstar or an icon, people love to stared when you wear it. Tugeda baby carrier | Soft Structured Carrier has been designed for better ventilation/air system using breathable materials and comfortable fabrics to make you and your baby cool using it. Tugeda baby carrier | Soft Structured Carrier, suitable to be used in any climate especially in sunny,hot,tropical climate so that baby’s not getting too hot. When baby’s comfortable, they’ll be more relax, calm and Less to cry / less to get cranky. Tugeda Baby Carrier / Soft Structured Carrier are proudly made in Kuala Lumpur, Malaysia. Introducing our 3 types of Tugeda Carrier : Air,Smart Street & iDEAL.